Papa, Ling, and Lilling wanted to get brunch on Sunday. Having had such success with the New York Magazine Best of '06 list at Taim, I decided to give them another at bat with their pick for best brunch: 202. Part of the New York brunch experience is waiting. Even if you have a reservation, you seem to wait. In this case, 202 was ready to seat us without a reservation right away, but the family Papa wasn't quite there yet (you know how it can be traveling with kids) so Wife and I spent about 10 minutes milling about and discovered part of what makes 202's brunch good: you can shop while you wait. We didn't choose to purchase the cool glass lamp for $750, but looking at it, and the clothing in a trunk show, was good way to spend the idle time. 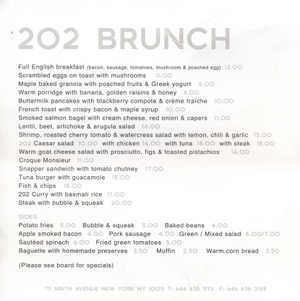 202 is in the Chelsea market and it is a café within a store that sells clothes and home furnishings. It's the kind of room that could turn into a sound nightmare, but all the hanging clothes and wood seem to temper it to an ambient din, particularly good for the meal parents are most likely to drag crying infants to (we counted about 5 in addition to Lilling). 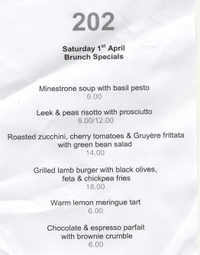 The menu boasts about 15 items with a list of around 5 specials and an assortment of breakfast sides. There is a somewhat British feel to the deal with sides like bubble and squeak and baked beans, and a full English breakfast offered. The English breakfast was what got the accolades from NYMag so that's what I got, but not before an appetizer. 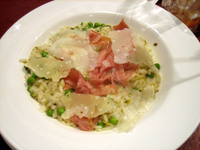 Leek & peas risotto with prosciutto was one of the specials on the list and, since we all wanted it, we decided to split an order as an appetizer. Although it would have seemed inconsequential at most meals, it was very nice for breakfast. Fresh and light, with large bits of shaved Parmigiano and thin prosciutto laid over the top. Full English breakfast (bacon, sausage, tomatoes & a poached egg) I guess there are as many variations of an English breakfast as there are baccalau reci pes. This one obviously favors a lower-fat tradition than I am used to. The one I'm familiar with has baked beans and black and white sausage, and the eggs are fried. 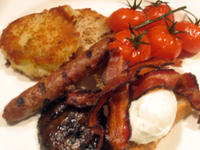 Here, the tomatoes are deep-fried, the toast is dry, the potatoes are a bubble and squeak cake (making the one I ordered as a side dish redundant) there is a strip of bacon and a link sausage. On the whole, this one made sense in its lightness. Everything was quite nice and the dish was not as heavy as the name conjures. As a footnote, Wife had the Lentil, beet, artichoke, & arugula salad and, based on my taste of it, with a glass of wine, this could be the best lunch salad around. Was it the best brunch I have ever had in NYC? No. Was it the best brunch 4 adults and a baby could have walked into that Saturday? I would say probably yes. The service left a little to be desired, but when I was served a corked bottle of Soave, a manager came right over, confirmed it was off, and quickly got another. Lilling blended right in at 6 months, we were served everything we ordered, and it was quite good. The espresso was solid, the prices were fair, on the whole it was a very positive experience. So far, NYMag is batting a thousand with me.